Product and service reviews are some of the most important factors which can affect customers' decision before purchasing products. Having more reviews from customers can help you to easily persuade more customers to buy from you and in turn this increases your sales. 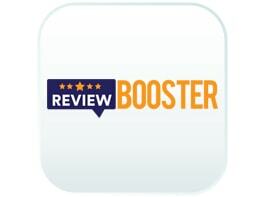 Review Booster can be used to send automated emails to customers after their purchase in order to prompt reviews from them. Review Booster is a customer relationship management application which is used to send emails to customers at a set period after their purchase, in order to prompt reviews from them. You select how many times you want the email to repeat itself to nudge your customers to leave feedback. The option to create custom email templates (in addition to the predefined templates) is also available in the app. In the left menu, there are different buttons. Click Review Booster to open it. The Dashboard displays information about the current status of the Review Booster, giving you an overview of the order, credit limit and list of current day emails (Send Email, Send Repeat Email). Orders (Accounts): Displays the percentage & number of order emails sent for review from Review Booster. You can view emails according to type - for example, Sent Email, Sent repeat email for current day. You are able to check all the emails already sent by the app, organized by date parameters. In Send Email Notifications, you can send emails to the customers which are in your system. In this screen, you will find a list of Sources and Sub Sources drawn directly from Linnworks orders. Users can set a Logo, Website Link, Review link, telephone number for use in the emails. Ticking a check box for a particular Sub Source means that email notification will be sent for orders from that particular Sub Source, for example. If you don’t need to send emails for orders from that Sub Source, then leave the check box un-ticked. The first column specifies the Source/Subsource. The second column reflects the logo to be used in emails. No Logo will be displayed if an image hasn’t been uploaded or selected. If you double click on the logo, a box will be opened where you can browse images already in the app, or you can upload one to be used. The next column allows you to specify a Link and a Review Link. The Link is your Company’s site or store, while the Review Link is the web location for the reviews to be written. Phone Number should contain the contact phone number of the business. When you select the checkbox, a Send Email dialog box will open. To allow emails to be sent, click Yes, otherwise select No. After all the configuration changes are saved, the app will confirm your changes have been saved. In the Email Account option, you can edit the email server configuration, or add a new account and server setup. Enter the server and account details, and select the Source/Subsource which it will be associated with. Enter the User Name, Password for the account and the From Name which will be used when email is sent from the account. Test your configuration and Save it. You are also able to Edit the saved configuration later. Click on the Pencil symbol to Edit. If you make changes, ensure you Test them. If the configuration is incorrect, you will be notified that it is an Invalid Account Configuration. If there are no errors, remember to press Save. The Email Template Type specifies the type of template to be sent to the users. It may be different based upon the country the customer is in, or from. There is a Search option available at the top of the window to search for templates. Country or Template Type are offered. You can edit each row displayed by clicking the Pencil button in the Action column. The Edit button (Pencil button) opens a window to set details such as the country the template is designed for, the template type, the delay (in days) after order processing before sending the email, and number of days to wait before sending a repeat of the email. Always remember to Save your changes before moving on. We can set up different Message Bodies for different Sub Sources. You can choose to Add a new message body or Edit an existing message body. To Add a new message body click the button. a.	Source/Subsource: Linnworks defines the Channel the orders are imported from based on the Source (Type, e.g. eBay, Amazon) and the SubSource (Channel Name within Linnworks). b. Logo: This automatically retrieves the logo of the Source/Subsource from Linnworks as seen in the Channel Integration screen. c.	Store Link: Retrieves the link of the store that was defined in the application settings. d.	Review Link: Retrieves the link for the seller’s preferred review platform that was defined in the application settings. e.	Phone: Retrieves the seller’s phone number, as define in the application settings. f.	Template Name: Specify the name of the template. g.	Template Type: Specify the type of the template (based on country). h.	Subject Tag: Specifies an order field that can be used in the email subject. Click Add to insert it into the Email Subject field. i.	Email Subject: Mixes text and information from the order itself using Subject Tag to display a custom subject for each email. j. Body Tag: Specifies an order field that can be used in the email body. Click Add to insert it into the Email Body. k.	Email Body: Starts with a predefined message. This can be customized with your own text, as well as with information from the order using Body Tags. To Edit a saved message body click the button. In the Edit screen, you can edit all the details specified. Always press Save to store the changes made. Messages are sent using credits from your account. There are subscription levels, corresponding to different monthly credit balances. If you are using Review Booster for the first time, or you need to upgrade your subscription because your needs have grown, simply click on the required subscription, and click Submit.